With recent popular apps being introduced & launch of the SDK for Echo, Can this become a 'Futuristic Gadget' for Everyone? Bluetooth speakers are out there for a while, but none of them could have received so much attention that the launch of Amazon Echo did. And why shouldn’t it? – It’s the first Bluetooth speaker that can talk and even listen to you as well. Not more than a year ago, Amazon started the invite-only process somewhat similar to OnePlus One and invited some of the celebrity technology adopters and tech journalists to introduce this so-called breakthrough product. It was all going on with almost no buzz until they started shipping the units in the open sale. And so, the hype in the tech world was pretty obvious. What exactly can this talking Bluetooth speaker do? Remember Jarvis? ( from the Iron Man movies?) similarly, you can talk to Amazon Echo by giving voice commands. It has ‘Alexa’ as a default keyword ( Similar to Ok Google or Siri), that elegantly lights up the Echo device, showing off that it is listening to you now. You can modify this keyword, but the default one works out best in my opinion. Echo is an amazing device to voice control the music. Search, play pause, you can do everything except buying the music on a voice command, at least not yet. But the good news is, it’s not just a talking music player. Get instant weather update in your local area, check the distance of a place from where you stay, add stuff to your shopping list, set an alarm clock, search movie details with the power of IMDB, and tens of other minor things. The software is currently receiving regular OTA updates from Amazon, for the addition of features and commands you can use. So one thing is clear, its a lot more than a Bluetooth speaker, and compelling piece of tech indeed. Amazon Echo might look like a simple cylindrical design, but the lightning effects make it aesthetically pleasing. It’s about 3 inches tall and has a power cable, so no batteries or charging is necessary. With the array of 7 microphones over its top side, it knows from where you are speaking, and it lights up towards the respective direction. With a superior reception quality of speakers, you can even talk (rather shout at) with it, even from over a long distances of about 30 feet (or from nearby rooms in your home) . Voice recognition is one of the best so far and can be compared with Siri and Google Now etc. 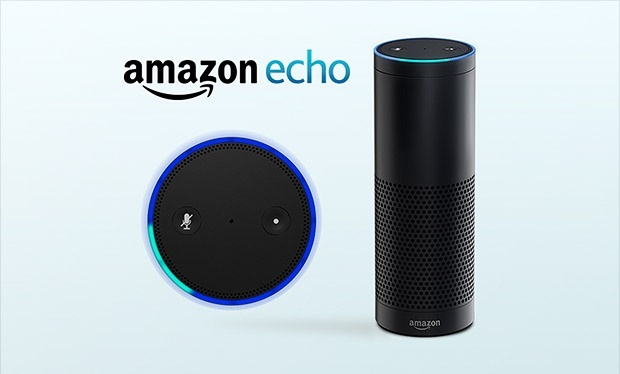 Echo is constantly listening to you, but it only accepts its voice command when you say the keyword i.e. “Alexa” or “Amazon”. Former seems a lot better name that can be adapted easily. There is also a mute button on top, that pauses the listening process. You can control Echo through its app available for platforms like Android, iOS and FireOS. There is also a web app that is useful to turn ON and OFF the different types of Skills (Apps) for Echo, and customize other settings. Everything you ever said to the Echo can be viewed in its app. All this data and your shopping list etc is not stored locally on your phone but on the Amazon cloud service. So if you use Echo’s shopping list feature to access your list, you’ll need a stable internet connection, which can be discomforting if you walk into a place with no range. It also comes with an additional Bluetooth remote which you can use for shuffling music or give voice command through this remote to the speaker. Being a Bluetooth remote, it will not give you an additional range, just that you won’t have to shout at your speaker if you are at longer distances, you can simply talk to the remote which will send your command to the speaker. The only technical downside is Echo needs to be plugged into a power supply switch, all the time. And no battery option, meaning it is not a portable device. Amazon Echo – Worth buying or not? Amazon Echo is priced at $99 for Amazon Prime subscribers and $199 for everyone else in the United States. The $99 is perfect price segment where you get most of the good quality, mid-budget Bluetooth speakers. The quality of Amazon Echo won’t be 100% competitive to these popular Bluetooth speakers, but it’s very much above average. If you are already a Prime subscriber, it’s a totally worth gadget to own, especially if you do not already own any other Bluetooth speaker as of now. But for $199, it might only be a good deal if you’re a tech enthusiast, someone who wants to try or own new pieces of technology at any prize. As Amazon Echo heavily relies on Amazon properties like Amazon Music & IMDB, it will be hard for anyone to adjust, if they don’t want to subscribe to these additional services. New apps like Pandora, TuneIn or iHeartradio have increased the available apps for Echo and we are hoping for more such integrations in future. The shopping list thing has a dedicated app, which does not directly sync with your Evernote like services that you currently use. But with the recent introduction of Alexa Skills Kit, we might see such third party app connections in future. And for rest of apps like Alarm, Weather and general tasks, we have at least two or three gadgets lying around in our home. If you already own home automation gadgets from WEMO, Hue by Phillips, Insteon or Smart Things, it might be worth for you to invest in Echo at the prize of $199. For the rest, you might want to wait for better apps or a prize drop. Like I have mentioned before, Amazon has rapidly pushed the new features to Echo in past few months, but it’s still a long way to go. Amazon has recently released the Amazon Echo SDK & Alexa Skills, that lets you integrate custom voice commands or develop apps. Given its magnificent voice recognition system, everyone is hoping to see it being integrated with other smart technologies that are already available like home automation systems, online radio and audiobooks. 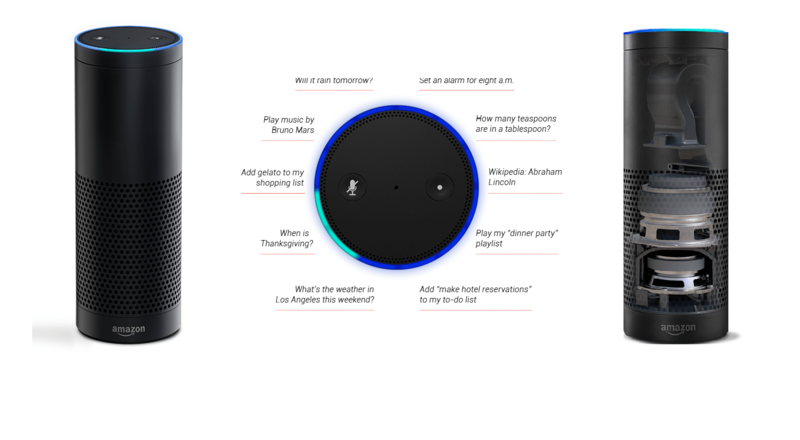 And with this open development system some of the well-known apps like Audible, Pandora, Questions & Answers (From Wikipedia), traffic & sports updates are now available on Amazon Echo. With millions being invested in voice controlled device technology from Amazon, and younger developers coming onboard, we are seeing a bright future and deeper integration of Amazon Echo into our lives. Check out what this young developer Simon Kessel has developed for echo, and he is just a student.. The worldwide launch is still much awaited, but it will only be possible after Amazon introduces its Prime services to major countries. This talking gadget might freak some people out, and remind them of movies like talking robot taking over the world. But to be honest, Amazon Echo is an amazing technology that can evolve into a must-have gadget for everyone in near future.